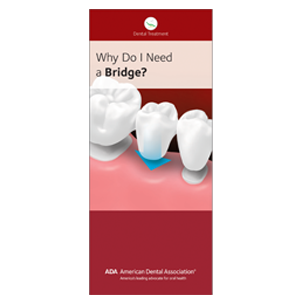 Show patients their options when considering a bridge. This brochure explains why missing teeth should be replaced, with illustrations of drifting adjacent teeth for maximum impact. Also advises when implants may be an option, shows the steps of bridge placement (both conventional and implant supported), and instructs patients on proper care of the bridge and surrounding teeth. Pack of 50, 8 panels. Pack of 50, 8 panels. PERSONALIZED Why Do I Need a Bridge?